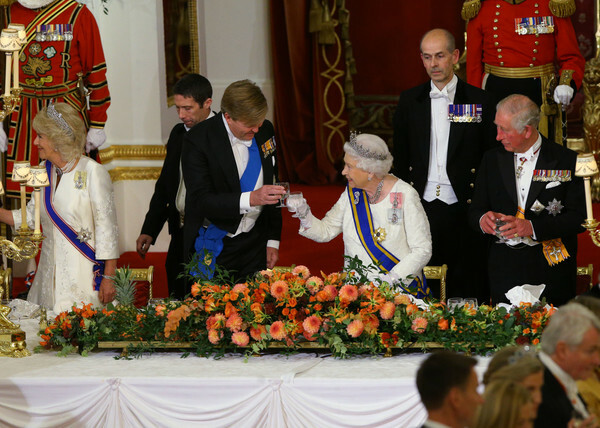 Queen Elizabeth II makes a toast alongside King Willem-Alexander of The Netherlands (2nd L) Camilla, Duchess of Cornwall (L) and Prince Charles, Prince of Wales (R) during a State Banquet to mark the state visit of King Willem-Alexander of The Netherlands and Queen Maxima of The Netherlands at Buckingham Palace on October 23, 2018 in London, United Kingdom. King Willem-Alexander of the Netherlands accompanied by Queen Maxima are staying at Buckingham Palace during their two day stay in the UK. The last State Visit from the Netherlands was by Queen Beatrix and Prince Claus in 1982.